SHREWSBURY, Mass. — Sharon girls’ tennis coach Diane Micheroni had a simple message to her two doubles teams as the Eagles soared through their journey to St. John Shrewsbury’s tennis complex Wednesday afternoon. With the Eagles holding onto a narrow 2-1 lead and Longmeadow’s No. 2 singles making a late push, Sharon needed to count on its second doubles pair of junior Rithika Neti and freshman Sophia Fein to cap off its perfect season. After splitting the first two sets 6-3 and 3-6, Neti and Fein saved their best tennis of the evening for the most critical moment of the Eagles’ season. The duo was in sync on almost every serve and returned everything the Lancers hit their way. 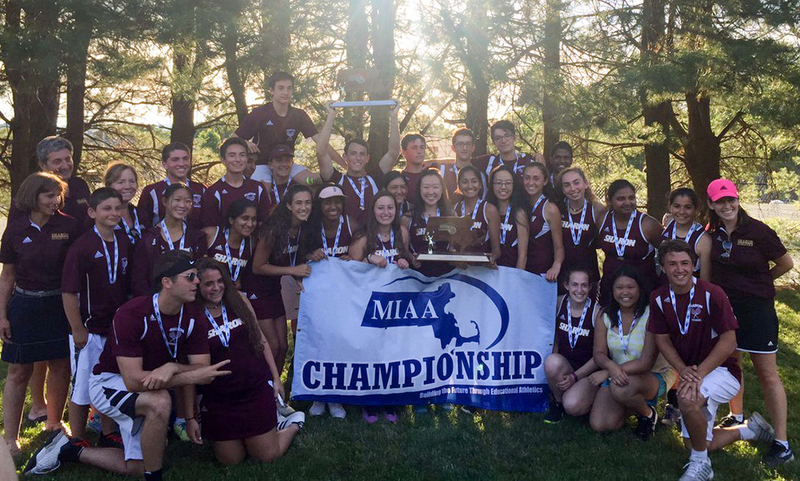 After returning a serve, Neti returned a volley that hit off Longmeadow rocket and out to secure a 26-0 record and a Division 1 state championship – the first in program history. The Eagles jumped out to an early lead after junior Lulu Yuan swept No. 3 singles 6-1, 6-0. Yaun finished the season undefeated at third singles in match play. Lancer No. 1 single Iris Gallo was very impressive, defeating Sharon sophomore Nupur Shukla 6-1, 6-1 to tie the match at one. Echoing Micheroni’s earlier statements, Sharon’s No. 1 doubles pair of Junior Katie Merport and Emily Wen took care of business in straight sets 6-2, 6-4. With the No. 2 singles match taking an intermission before the tie-breaking set after Lancer Hallie Gallo took the first set 6-4 and Sharon freshman Emily Zhang winning the second 6-4, almost everyone in attendance shifted their focus to the second doubles pair. Sharon Athletic Director Bill Martin praised Micheroni’s leadership and how Sharon hopes to remain a successful program for years to come. As sweet of a moment Wednesday’s win was for the entire Eagles team and community, it even meant a little bit extra to Sophia Fein. Following the No. 2 doubles win and amidst her teammate’s hugs and screams of jubilation at the center of Court 5, Sophia turned and found one of her biggest supporters, mentors and role models standing there to greet her. Her brother, Griffin, a two-time Hockomock League MVP, awaited with open arms as his younger sister walked off the court a state champion after he had rushed over from across town following the boys’ championship match earlier that afternoon. With the boys’ side having a long, decorated history and the entire team in attendance to support their counterparts, this was the first state championship appearance for the girls team in school history. The Eagles’ 26-0 mark also is the best season in the program’s history. Earlier in the afternoon, the boys’ team sought redemption from their 2015 state championship defeat against Wayland High School after the Warriors narrowly took the title 3-2 two years ago. Wayland once again got the better of the Eagles, sweeping singles play en route to a 4-1 victory in the Eastern Massachusetts boys’ Division 2 Final at Shrewsbury High School. With the Eagles already behind 2-0 after victories in singles No. 1 and 3, junior Fred Bondar battled back and forth with the Warriors’ Jaylen Wang in the second singles match. Wang took the first set 7-6 (7-4) and ended up taking the second 6-3 with Bondar battling calf cramps in a frame that was much closer than the final score indicated. Griffin Fein dropped No. 1 singles against Georgetown-bound Charlie Sharton 6-0, 6-1, while Wayland’s Will Barton also gave the Warriors an early lead defeating Andre Olivei 6-2, 6-1 putting Sharon in an early hole. Much like Wang and Bondar, Fein and Sharton also faced each other in the 2015 final with Sharton winning in straight sets. Alex Romantz and Alberto Olivei took home the lone Sharon victory of the day in No. 1 doubles. The pair dropped the first set 6-7 (6-8) but would rally back to defeat Wayland’s Gage Fuller and Will Gardner in set two, 6-3, and three, 6-1. Romantz and Olivei finished unbeaten as a team in 2017. In No. 2 doubles, the Eagles’ Danujan Thirumavalavan and Max Brody took the first set 6-3, before dropping the second and third sets, both by a score of 7-5. Despite the Eagles coming up just short of the championship, Cutter had nothing but good things to say about their season as a whole. 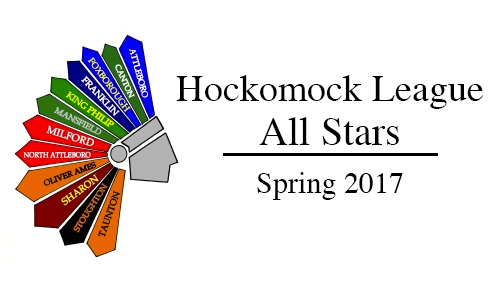 Below are the official 2017 Hockomock League Girls Tennis All Stars, selected by the coaches in the league. For a history of recent Hockomock League Girls Tennis All Stars, check out our history section. HINGHAM, Mass. – Shortly after last year’s D1 South Sectional Final, Sharon girls tennis coach Diane Micheroni made it clear that the plan was for Eagles to be back in the same spot again. Not only did they make the return trip, this time around they walked away with the win and the D1 South title. After falling to Wellesley in the South final a year ago, top-seeded Sharon exacted some revenge this time around, sweeping singles play for a 3-2 win over the previously unbeaten and second-seeded Raiders. Click here for a photo gallery from this match. While most programs make it a goal to get this far, Micheroni had the confidence to pencil it in that the Eagles would be back. Part of the reason for the confidence was that Sharon brought its two top singles players back from last year’s squad, plus a handful of experienced doubles players. And on top of that, the Eagles got a huge boost with the addition of freshman Emily Zhang, who has started at second singles all season. 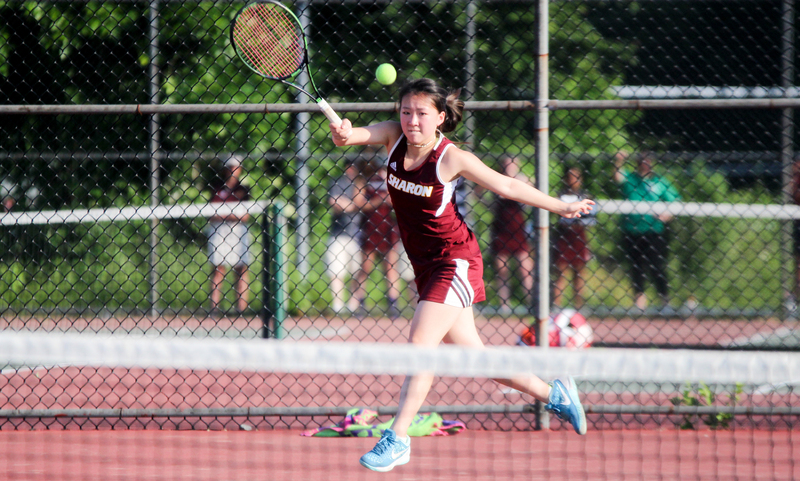 With Zhang in the fold, junior Lulu Yuan – the 2015 Hockomock League MVP – made the switch from first singles to third singles, and sophomore Nupur Shukla moved up from second to third singles. Yuan put the Eagles on the board first in the match, quickly jumping out to a 4-1 lead before winning the first set 6-1. The second set didn’t take much time as Yuan finished off her opponent in similar fashion, walking away with a straight set 6-1, 6-1 win. Yuan, who was named team MVP, has taken the move from first to third singles in stride. Yuan is unbeaten on the year, and has only lost a total of four games – two of which came against the Raiders. The Raiders evened the match at one game apiece with a win at second doubles. Sharon’s Rithica Neti and Sophia Fein had tied the match early in the second set, but eventually fell 2-6, 3-6. Sharon moved back into the driver’s seat as Zhang came away with an impressive win at second singles. Zhang jumped out to a 2-1 lead over Wellesley’s Caitlin Avery, one of the top singles players in the area, and won the first set 6-3. Zhang didn’t slow down at all, going ahead 3-0 in the second set and eventually scoring a 6-2 win at the second set to put the Eagles up 2-1. That put all the eyes on first singles. With first doubles split one set apiece, the teams took a timeout as first singles finished. Shukla built a 3-0 lead in the first set only for Wellesley freshman sensation Alex Coleman to win three of the next four, cutting the lead to one. Shukla came through, taking the first set 6-3. At the time of the break, Coleman held a 4-3 lead in the second set. The two split the next two sets, giving Coleman a 5-4 edge and just four points away from forcing a third set. Instead, Shukla – who was down 0-15 and 30-40 and just one point away from a third set – rallied, tied it at 40-all, won the advantage point and won the next point to tie it at 5-5. Coleman, who was serving, raced out to a 40-0 lead, again just one point away from winning the next point. But Shukla had other plans, rattling off five straight points to take a 6-5 lead in the set. It was time for Coleman to rally, overcoming a 0-30 hole and winning the point to make it 6-6, sending the second set into a tiebreaker. With the momentum of her side, Coleman jumped out to 3-0 lead, the last point coming a spectacular shot down the line. But once again, with her back against the wall, Shukla rallied with four straight points to go up 4-3. After Coleman tied the game, two straight points from Shukla made it 6-4. Coleman cut it to one again but Shukla finished the tiebreaker off with a great shot that forced an error, giving her a 6-3, 7-6 (7-5) win and the Eagles the clinching point for the sectional title. Sharon’s second doubles resumed play before Shukla’s win in a tiebreaker, so the match went to a third set instead of a 10-point tiebreaker. Katie Merport and Emily Wen, who won the first set 6-4 but lost the second set 3-6, fell behind 1-4 in the third set. But even with the title clinched, the Eagles’ duo didn’t give up and battled all the way back to tie the match 5-5. With very little light left to work with – the match now over three hours long – it was agreed to send the match into a tiebreaker. Wellesley won the tiebreaker, 7-0. Sharon girls tennis moves on to the D1 State Semifinals on Monday, June 12th. The Eagles will play the North champs, Westford Academy (13-5) at Newton North High School at 3:30. #5 Taunton, 1 vs. #12 North Attleboro, 4 – Final – Click here for a recap of this game. #9 King Philip, 8 @ #8 Bishop Feehan, 7 – Final (8 inn.) – Click here for a recap of this game. #11 Mansfield, 9 @ #6 Wellelsey, 10 – Final – Mansfield outscored Wellesley 6-0 in the fourth quarter but its comeback effort came up just short on the road. Joey Olsen’s effort at the face off X helped the Hornets orchestrate their second half comeback. Cullen Murphy and Josh London played well defensively in front of Jack Munroe while Hunter Ferreira paced the offense with seven goals. #1 Sharon, 5 vs. #16 Natick, 0 – Final – Sharon lost just one game total in its three singles matches, cruising to a sweep of Natick. Nupur Shukla won 6-1, 6-0 at first singles and Emily Zhang and Lulu Yuan won 6-0, 6-0 at second and third singles, respectively. The team of Katie Merport and Emily Wen won 6-3, 6-1 at first doubles and Rithika Neti and Sophia Fein captured a 6-2, 6-3 win at second doubles. Attleboro @ Oliver Ames – Postponed to Tuesday, 5/16 at 3:45. Canton @ Sharon – Postponed to Tuesday, 5/16 at 3:45. Milford @ Foxboro – Postponed to Thursday, 5/25 at 3:45. Mansfield @ Franklin – Postponed to Thursday, 5/18 at 7:00. King Philip @ Taunton – Postponed to Tuesday, 5/16 at 3:45. North Attleboro @ Stoughton – Postponed to Tuesday, 5/16 at 3:45. Oliver Ames @ Attleboro – Postponed to Tuesday, 5/16 at 3:45. Sharon @ Canton – Postponed to Wednesday, 5/24 at 3:45. Foxboro @ Milford – Postponed to Friday, 5/19 at 4:00. Franklin @ Mansfield – Postponed to Tuesday, 5/16 at 3:45. Taunton @ King Philip – Postponed to Tuesday, 5/16 at 3:45. Stoughton @ North Attleboro – Postponed to Tuesday, 5/23 at 3:45. North Attleboro, 11 @ Attleboro, 1 – Final – North Attleboro outscored Attleboro 7-0 in the second half to pick up a non-league win. Tommy Lindstrom orchestrated the offensive attack, registering five assists while Zach McGowan scored twice and added two helpers. Paul Yeomans (two goals, one assist) finish with three points while Jason McNeany (goal, assist), Colin Young (two goals) and Jack Dakin (two goals) each had two points. Owen Costello and Zac Doucette each scored once and Brett Labonte and Hunter Sarro each had an assist. Canton, 5 vs. Braintree, 3 – Final – Canton outscored the visitors 4-1 in the second half to pick up a win on senior night and keep its postseason hopes alive. Senior Dan Dillon led the charge, notching three assists and scoring the game-winning goal with just over three minutes left to play. Senior Ryan Lodge and sophomore Mike Shaw each netted a pair of goals to round up Canton’s attack. Freshman Jack Connolly made 11 saves in net while CHS coach Bill Bendell praised the work of junior Charlie O’Connor at the face off X and the defensive work of senior Michael Pigeon. Franklin, 11 @ St. John’s Shrewsbury, 12 – Final (2OT) – St. John’s rattled off a 5-0 run in the second half to create an 11-7 cushion but the Panthers answered, scoring four straight goals over the final 5:45, capped with a goal from freshman Jake Davis with just seven seconds left to send the game into overtime. The Panthers won the face off at the beginning of each overtime period but couldn’t covert and the Pioneers netted the winner with 1:02 to go in the second overtime. Eric Civetti led Franklin’s offense with seven goals and one assist, Packie Watson scored twice and had one helper and Nitin Chaudhury scored once. Sam Arsenault, Jack Platner and Kyle McEniry had had one assist while Jacob Alexander won 19 face offs. Oliver Ames, 9 @ Pembroke, 8 – Final – Oliver Ames freshman Shane Kikelly and junior Owen Gallagher each recorded a hat trick to pace the Tigers’ offense. Senior Liam Brown, junior Eric LeBlanc and freshman Sam Stevens rounded out the scoring with a goal apiece. North Attleboro, 17 @ Attleboro, 3 – Final – Erin Holley paced the Rocketeers, who had 11 different goal scorers in the win, with four goals and a pair of assists. North also got five assists from Katie Lindstrom, a goal and three draw controls from Julia Noreck and two goals and two assists from Camille Pizarro. Franklin, 8 vs. Westwood, 7 – Final – Franklin freshman goalie Gianna Cameron made 15 saves and FHS head coach Kristin Igoe Guarino had high praise for her defensive unit, anchored by Dana Lewandowski and Grace McDermott. The win marked the Panthers’ first ever win over Westwood, the defending D1 state champions. Caroline Lounsbury led the offense with three goals, Erin Walsh netted two goals and Annie Walsh recorded a goal and an assist. Jordan Jette had two helpers and Kendall Reardon and Kelsey MacCallum both found the back of the net once. Mansfield, 5 vs. Medway, 10 – Final – Click here for a photo gallery from the game. Taunton, 14 @ Norton, 6 – Final – Taunton eighth grader Alana Tavares scored a team-high eight goals and assisted on three others to pace the Tigers to a win on the road. Kayla Phillips netted a hat trick, Abbey Kingman scored twice and Annie Tate (two assists) found the back of the net once. Lorni Li turned away 12 shots in goal for the Tigers. Sharon, 5 @ Canton, 0 – Final – Sharon won all five matches in straight sets, losing a total of just seven games on the road. Griffin Fein won 6-1, 6-1 at first singles, Fred Bondar notched a 6-0, 6-1 win at second singles and Andre Olivei recorded a 6-0, 6-0 win at third singles. The team of Alex Romantz and Alberto Olivei won 6-1, 6-1 at first doubles and Sammy Kirshenbaum and Max Brody prevailed 6-0, 6-2 at second doubles. Foxboro @ Milford – Postponed to Tuesday, 5/16 at 3:45. Taunton @ King Philip – Postponed to Wednesday, 5/24 at 3:45. Stoughton @ North Attleboro – Postponed to Tuesday, 5/16 at 3:45. Canton, 0 @ Sharon, 5 – Final – Sharon dropped just one game in total among three singles matches to beat Canton. Nupur Shukla won 6-0, 6-0 at first singles, Emily Zhang captured a 6-0, 6-0 win at second singles and Lulu Yuan won 6-0, 6-1 at third singles. The team of Sydney Gordon and Lauren Glass won 6-0, 6-1 at first doubles and Sachi Bhasin and Akhila Sanadi won 7-6, 7-0 at second doubles. Milford @ Foxboro – Postponed to Tuesday, 5/23 at 3:45. Mansfield @ Franklin – Postponed to Tuesday, 5/16 at 3:45. King Philip @ Taunton – Postponed to Wednesday, 5/24 at 3:45. Taunton, 4 @ Foxboro, 1 – Final – Taunton’s offense plated its first run in the top of the first inning, added two more in the fourth inning and tacked on another insurance run in the seventh inning to record a win on the road. Christian Simoes went 2-for-3 for the Tigers with an RBI and a run scored while Matt Machado (run) and Tyler Medeiros (RBI) each went 1-for-3 for the Tigers. Mansfield, 3 @ Sharon, 5 – Final – Sharon junior Max Tarlin impressed on the bump, tossing six innings with just four hits allowed to earn the win. Tarlin allowed two unearned tuns, walked just one and struck out six for the Eagles. Sharon scored once in the second and then exploded for four runs in the third inning. Aiden Arnold (RBI, run) and Jake Teven (run) each had two hits for the Eagles while Spencer Singer (RBI, run), Drew Naisuler (run), Ben Schwartz (RBI), Danny Emerman (two RBI) and Jake Marglous (run) each had one hit. Mansfield’s Zack Peterson (two RBI) and Kevin Dow (home run) each went 1-for-3 for the Hornets. Oliver Ames, 2 @ Milford, 1 – Final – Oliver Ames sophomore Matt McCormack made an immediate impact in his varsity debut, coming on in relief to pick up the win for the Tigers. McCormack came on with the bases loaded and just one out, but escaped the jam with a pair of strikeouts. The sophomore threw 3.2 innings, collecting the win by allowing just one hit while striking out four. OA head coach Joe Abarr praised the defensive work of sophomore Chris Pearsons (six putouts, run) at third base. OA took the lead in the fourth inning when Kyle Gagliardi singled with two outs, stole second and came home on an outfield error. Milford tied the game in the bottom of the fourth on an RBI single from Alex Coady. OA scored the winning run in the sixth, with Pearsons scoring on a passed ball. Alex Macek threw a complete game for Milford, allowing just four hits with seven strikeouts and two unearned runs allowed. Foxboro, 1 @ Taunton, 12 – Final – Taunton scored in every inning and picked up a seventh win of the season. Courtney Fisher went the distance in the circle, striking out three. Jaime Brown, Liana Duarte, Kya Enos, and Hannah Aldrich each had three hits for the Tigers and Hailey Medeiros had two hits. Duarte drove in three runs and Medeiros and Aldrich each had two RBI. Stoughton, 0 @ King Philip, 14 – Final – Elise Pereira tossed six shutout innings for the Warriors, striking out 11 in the process. KP hit three homers and pounded out 13 hits on the day. Meghan Gorman went 2-for-5 with a homer and three RBI, Betsy Walsh went 2-for-4 with a homer and three RBI, and Paige Kuchy went 2-for-3 with a solo homer. Stoughton only managed three hits – a double by Jordan Lyons and singles from Gina Carafa and Alesandra Lofredo. Sharon, 3 @ Mansfield, 9 – Final – The Eagles held a 3-0 lead into the sixth inning before the Hornets rallied with nine runs to pick up the victory. Mady Bendanillo started the rally with a walk and Liz Mackin reached on an error. Sarah Cahill, who picked up the win an struck out nine, singled in the first run and Marissa Staffer followed with a single that plated two and tied the game. Caty DeMassi had an RBI on a fielder’s choice to give the Hornets the lead and Megan Letendre doubled home two runs. Mady Bendanillo came up for a second time in the inning and capped the scoring with a three-run homer. Milford, 9 @ Oliver Ames, 1 – Final – Shannon Cormier collected a pair of hits and knocked in three runs to pace Milford to a win on the road. Cormier also had a stolen base while Emily Piergustavo went 3-for-3 with two runs and a stolen base. Kelley Reichert (1-for-3, home run) earned the win, tossing a complete game with no earned runs allowed. OA’s Katie Abreu went 2-for-3, Lexie Campbell was 2-for-4 and Victoria Ziner had a hit and scored a run for the Tigers. Taunton, 5 @ Mansfield, 18 – Final – Mansfield used eight different goal scorers to pick up a division win. Ann Maher led the way for the Hornets with five goals and Maire Foley added four. Hannah Sternburg made 10 saves for Mansfield. Alana Tavares had a hat trick and Delaney Powell a pair of goals for the Tigers. Stoughton, 0 @ King Philip, 5 – Final – King Philip dropped just a total of four games across five matches to earn a win over visiting Stoughton. Blake Ginter won 6-1, 6-0 at first singles, Martin Matous won 6-0, 6-1 at second singles and Marco DiStefano took a 6-0, 6-0 decision at third singles. The team of Ryan Gemelli and Aidan Igantius won 6-0, 6-0 at first doubles and Jake Webster and Tim Costanzo won 6-2, 6-0 at second doubles. Sharon, 5 @ Mansfield, 0 – Final – The Eagles won all five matches in straight sets and dropped just three games in doubles play to pick up a win on the road. Senior Griffin Fein won 6-2, 6-3 at first singles, junior Fred Bondar won 6-4, 6-0 at second singles and junior Andre Olivei won 6-2, 6-3 at third singles. The team of senior Alex Romantz and freshman Alberto Olivei won 6-1, 6-0 at first doubles and sophomore Danujan Thirumavalavan and junior Ashwin Sreevatsa won 6-1, 6-1 at second doubles. Taunton, 4 @ Foxboro, 1 – Final – Taunton notched a key win on the road at Foxboro, losing just four games total in doubles play to beat the Warriors. Ashleigh Eason won at second singles, taking the first set 6-3 before Foxboro retired due to injury. Jillian Pagliuca won 2-6, 6-1, 6-2 at third singles for the Tigers. The team of Emily Moor and Callie Hebert won 6-2, 6-0 at first doubles and Vanessa Rosa and Jordan Martin won 6-1, 6-1 at second doubles. Foxboro’s Lexi Nelson won 6-2, 6-3 at first singles. Mansfield, 0 @ Sharon, 5 – Final – Sharon lost just two games total in singles play and five games in doubles play in a sweep of Mansfield. Nupur Shukla won 6-0, 6-1 at first singles, Emily Zhang won 6-1, 6-0 at second singles and Lulu Yuan won 6-0, 6-0 at third singles. The team of Katie Merport and Emily Wen won 6-0, 6-2 at first doubles and Sophia Fein and Akhila Sanadi won 6-3, 6-0 at second doubles. Oliver Ames, 3 @ Milford, 2 – Final – Oliver Ames’ Claudia Ferrara battled through a three set thriller and its second doubles team rallied from an 0-5 deficit to help the Tigers prevail with a win at Milford. Ferrara won 6-3, 3-6, 6-4 at second singles and Olivia Groebe and Emily Gordon battled for a 6-2, 7-6 (7-5) win at second doubles. OA’s first doubles team of Tori Wyman and Kristin Bloumbas notched the team’s first win with a 6-1, 6-3 decision at first doubles. Milford’s Julie Rabinowitz won 6-3, 8-6 at first singles and Caitlin Cafarella won 2-6, 6-4, 6-4 at third singles for the Hawks. Taunton, 3 vs. Quincy, 0 – Final – Taunton punched its ticket to the postseason for the first time since 2013 with a sweep of Quincy, 26-24, 25-19, 25-18. Lance Law had a team-high 12 kills as well as six digs, two blocks and an ace, David Fusiecki had nine kills, 10 digs and an ace and Nick Sorm chipped in with 11 digs, seven assists and four kills for the Tigers.